Image caption The Novaya Gazeta report accused Stalin of being "bound by much blood"
The European Court of Human Rights has rejected a complaint brought by one of Joseph Stalin's grandsons over an article accusing the Soviet dictator of being a "bloodthirsty cannibal". The report, in Russian newspaper Novaya Gazeta, looked at the Soviet leader's role in the 1940 massacre of Polish prisoners at Katyn. The grandson, Yevgeny Dzhugashvili, said it violated his right to privacy. But the court said Stalin remained "inevitably" open to criticism. Novaya Gazeta, a frequent critic of the Kremlin, published the article in 2009. It accused wartime Soviet leaders, including Stalin, of being "bound by much blood" by ordering the execution of some 20,000 Polish prisoners of war at Katyn. 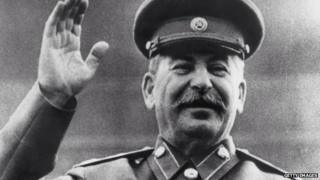 Stalin, who died in 1953, was described as a "bloodthirsty cannibal". Mr Dzhugashvili considered the article defamatory and sought damages in a Moscow court, which ruled against him. A further claim, made after Novaya Gazeta published an article discussing the defamation hearing, was also rejected. He then lodged a complaint with the European Court of Human Rights, saying the Russian courts had failed to protect his grandfather from attacks on his reputation. The court agreed that in some circumstances, attacks on a dead person could affect a living relative's rights. But it ruled the Russian institutions had successfully balanced journalistic freedom of expression and Mr Dzhugashvili's right to privacy. The court said the articles "concerned an event of significant historical importance and that both the event and historical figures involved, such as the applicant's grandfather, inevitably remain open to public scrutiny and criticism". For years, the Soviet Union said the Nazis were responsible for the massacre at Katyn. Former leader Mikhail Gorbachev admitted Soviet responsibility in 1990, and in 2010 Russian President Vladimir Putin joined his Polish counterpart Donald Tusk at a memorial - the first time a Russian leader had publicly commemorated the killings.